Enter the The Glama Project. Callie counts her Grandma Nita among her best friends. The Glama Project was born of her desire to remake her grandmother’s flagging spirits after a heart attack, at age 88, necessitated a move to an independent living facility. GG50: Callie, how did you come to understand what your Grandmother Nita was going through and how you could help her? Callie: We found a wonderful home for her and my mom and my aunts did an awesome job of decorating her apartment just like her apartment was. I really tried to keep in touch. But what I was picking up on each time I called was that she wasn’t herself. I think not only losing a lot of her possessions, but also the idea that, “I’ve lost my independence” was really hard for her. And then having so many people to suddenly compare herself with. 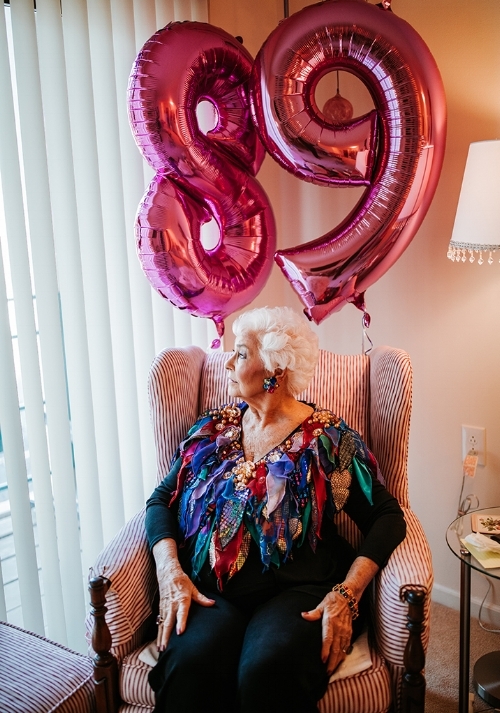 It wasn’t until she got into the home that she really felt like she was 88. She knew it, but I don’t think she felt it. Before she was on her own, so she didn’t have anybody to compare herself with. GG50: That must have been incredibly hard to hear. Callie: My grandma never used to say those things before! I just started realizing this is really taking a hit on her confidence and I wasn’t going to let her go down that way. We were on the phone one night and she was looking at a picture in her room. We used to do glamour shots when I was little. I called my cousin who is a professional photographer and we had this wonderful day when we did her makeup. She had so much fun, getting her picture taken, changing outfits and wearing all her jewelry. Once I gave her the photos she started wanting to go to dinner and she wanted to show those photos off. GG50: And so the Glama Project was born? Callie: I decided in that moment that I would make this a thing. More women need to feel this way. The beauty industry forgets about seniors. They don’t advertise to them, they target millennials. We have these unrealistic expectations of beauty these days. Why aren’t we being more real? I found a couple of senior homes in San Diego, where I live, that would allow us to come in and do a whole Glama shoot. Since March we have made over and photographed 70 Glamas! I think hands are really important to shoot because they tell such a story. We don’t do retouching. Sometimes we soften things here and there but I really want to leave the realness and the beauty of their photos. So many of them have walked out and said, “I didn’t know I could look like this!’ Or “I still got it!” I just got a text from someone’s family saying this Glama didn’t want to wash her face! GG50: What have you’ve learned from the Glamas? Callie: They have so much to teach us. My generation is so stuck in our own world and stuck on our phones. You really get a larger perspective talking to older generations. They’ve lived through things that my eyes won’t see. We have so much to learn from them and if we don’t ask these questions. These stories are going to get lost. GG50: What are your Top 3 Glama Beauty Go-To's for women over 80? 1) Skin Prep: We believe more mature skin can handle foundation just like someone in their 20's IF you prep it right! Starting with a balanced + smooth base is key. For dry skin, we recommend applying a rich, plant-based moisturizer like Weleda Skin Food. For combo/oily skin, we recommend a primer or moisturizer that can be PH balancing, we're big fans of using ELTA MD SPF as it acts as your sunscreen and is great for acne or sensitive skin types! 2) Add Warmth: As skin ages, we tend to lose our warmth. Adding colors like blush and bronzer along the cheek, temple, and jawline can make a dramatic impact in no time flat. However, remember the Rule of "3" - swirl your brush making a 3 symbol on either side of your face - it's a good guide to know where warmth and color should go! 3) Set it & Flaunt it: Setting sprays are great at locking in a look for continuous wear. We love Gerard Cosmetics Slay All Day spray as it comes in many different scents like green tea and lavender. We use a few spritz of spray after each makeover to ensure our GLAMA's glow all day long! Just make sure you're spraying an arm's length away for best coverage! View the full Glama Gallery here.